When I visited Tokyo I found time to seek out St Andrew’s Cathedral and St Alban’s Church, two flourishing Japanese-Anglican churches with links to Bishop Samuel Heaslett (1875-1947), whose life story I’d discovered in the course of local-history research in Sheffield. Relatively few buildings in central Tokyo predate the devastating bombing of 1945, but I read that the chapel of St Luke’s International Hospital was “one of the few original Anglican church structures in central Tokyo built prior to the Second World War”, and realised that it was located in Tsukiji, a couple of metro stops from where I was staying. St Luke’s International Hospital was founded by an American physician and Episcopal missionary, Dr Rudolf Bolling Teusler (1876 – 1934), who began working in Tokyo in 1900. The replacement hospital of 1933, now the administration building of the modern St Luke’s, contains the chapel, completed in 1936. The first floor landing leads into a high, Gothic Revival nave with a raised chancel and, above the entrance, an elaborate organ case, installed in 1988. The walls are ashlar and there is geometrical stained glass in the east window. There is a font, pulpit, lectern and choir stalls, and a lamp indicates the reservation of the Blessed Sacrament: http://hospital.luke.ac.jp/eng/about/chapel/index.html. Notices forbidding photography were everywhere. I was content simply to sit there. It was the only place in Tokyo where I felt any sense of connection with the past. It also provides, in the words of the hospital website, “quiet space to find comfort and strength in difficult times”. Another more modern chapel, Teusler Hall, in the adjacent wing has the same sense of peace. Indeed, the entire place is capacious, unhurried and dignified. Corridors are embellished with flower arrangements and pieces of art. Staff and visitors move about decorously. Christianity is a minority religion in Japan: its adherents amount to less than 1% of the population. Nevertheless, St Luke’s carries an effective mission that has grown directly from the work of missionaries a hundred years ago. This entry was posted in Sacred Places on June 29, 2016 by Mike Higginbottom. When I explored the material in Sheffield Archives about the parish of St Cecilia, Parson Cross, I came upon a complete run of parish magazines from before the church was consecrated in 1939 until the mid-1950s. The bulk of these magazines were edited by the first vicar, Fr (later Canon) Richard Roseveare SSM (1902-1972), charting the sprouting of streets and houses on what had been farmland, the establishment of one of the biggest parishes in the Church of England with three churches and six or seven clergy, and the impact of the Second World War and its aftermath on the initial high hopes and ambitious plans for Parson Cross and St Cecilia’s. He was a powerful figure, with a finger on the pulse of Sheffield working-class people – he formally opened the Parson Cross Hotel in June 1939 and ended up in the News of the World for his pains – and also a strict Anglo-Catholic who exhorted his parishioners to worship with due decorum. St Cecilia’s parish started out with high-status helpers. Lady Mabel Smith, the socialist daughter of the Earl Fitzwilliam, was a strong supporter until her death in 1951, and Mary Jane, Dowager Countess Ferrers, built a house on Halifax Road so she could help in the parish. When Lady Ferrers died in 1944 her house became the home of Bishop Samuel Heaslett (1875-1947), who was Bishop of South Tokyo from 1921. After the attack on Pearl Harbor in 1941 he was given a very hard time by the Japanese authorities, who couldn’t grasp the idea that a Church of England was not a government agency, and after four months’ imprisonment and interrogation he was expelled from Japan. Back in England Bishop Heaslett was offered a role as Assistant Bishop of Sheffield and came to Parson Cross in 1944. He returned to Japan with his opposite number, the Bishop of North Tokyo, an American Episcopal Bishop, Charles S Reifsnider, to help the reformation of the Anglican church in Japan, Nippon Seikōkai, in May and June 1946. The Tokyo cathedral that Bishop Heaslett knew had been obliterated in the bombing of Tokyo towards the end of the war. A wooden replacement building, St Alban’s Church, opened in 1956, designed by the Czech-American architect Antonin Raymond (1888-1976). It stands alongside the more substantial St Andrew’s Cathedral (Hisao Kohyama 1996). Samuel Heaslett is commemorated in Sheffield Cathedral by a wall-tablet, and he appears in the Te Deum window in the Chapel of the Holy Spirit. From the pages of dusty old magazines, a memorial tablet, a face in a stained-glass window, fascinating stories emerge of lives lived in times that feel very different from the present day. This entry was posted in Sacred Places, Sheffield's Heritage on June 21, 2016 by Mike Higginbottom. A couple of years ago I went to some lengths to involve myself in the debate about the future of the practically redundant church of St Cecilia, Parson Cross, Sheffield. I’d seen the demise of a nearby parish church of the same period, St Hilda, Shiregreen, which slipped past the attention of members of the local community who would have wished to find a productive use for the building if they had been alert to the fact that it was threatened. The latest development over St Cecilia’s is a draft pastoral scheme to appropriate the building for residential purposes and to dispose of its contents – a welcome alternative to the earlier proposal simply to demolish it, because it will, in the words of the Statutory Advisory Committee of the Church Buildings Council, “preserve the external envelope of the church and therefore preserve the townscape presence of the building”. I researched the parish records held in Sheffield Archives to try to discover why this substantial building, completed in 1939, had presented such intractable problems of maintenance that its decreasing congregation abandoned it in favour of a smaller mission church, St Bernard of Clairvaux, elsewhere in the parish. It seems that, in common with other buildings of its period, it was designed in the expectation that a large new parish on a vast housing estate could support regular, skilled maintenance. The architect, Kenneth Mackenzie, did no other church designs, as far as I know. He was the nephew of the Sheffield industrialist, Albert Reaney Heathcote, who contributed £13,000 towards its construction. In fact, the Parochial Church Council minutes show that £600-worth of repairs were pending by 1953. By 1961 the vicar described the building as “jerry-built”, which is perhaps unfair – it’s actually a substantial structure – but mortar was disintegrating from the stonework and plaster regularly fell away from behind the altar. When I visited the building in 2013 it was like the Marie Celeste. Although services had ceased three years before, there were vestments hanging in the vestry, hymn-books stacked in their cupboards, and music was still propped on the organ music-stand. All the internal fittings must go, taking with them much of the history of seventy-seven years of parish life – the Stations of the Cross, given in memory of the Sheffield Coroner, J Kenyon Parker, the rood, the installation of which in 1949 caused a feline spat between the Vicar, Canon Roseveare, and the Chancellor of the Diocese, the reredos designed for Holy Trinity, Bolton (1923), and the huge Cousans organ, provided by the Church Burgesses in 1987 incorporating parts of earlier organs from the churches of St George, Sheffield, and St Luke’s, Crookes. It’s a blessing that the small, cohesive congregation worshipping at St Bernard’s will be relieved of the responsibility for the much bigger building at St Cecilia’s. The residents of Chaucer Close, which is in places within yards of the church, won’t have the noise and pollution of a brick-by-brick demolition. And a fine mid-twentieth century building can survive in a part of Sheffield that has all too few significant pieces of architectural to enliven the sea of houses. This entry was posted in Sacred Places, Sheffield's Heritage on June 13, 2016 by Mike Higginbottom. My friend Eric and I, trapped by the rain in a Lebanese restaurant behind Selfridges, made a run for it to the Wallace Collection, which I’d never visited before. This stunningly beautiful treasure house of art is the product of four generations, the 3rd, 4th and 5th Marquesses of Hertford and the 5th Marquess’s illegitimate son, Sir Richard Wallace Bt (1818-1890), whose widow bequeathed it to the nation. 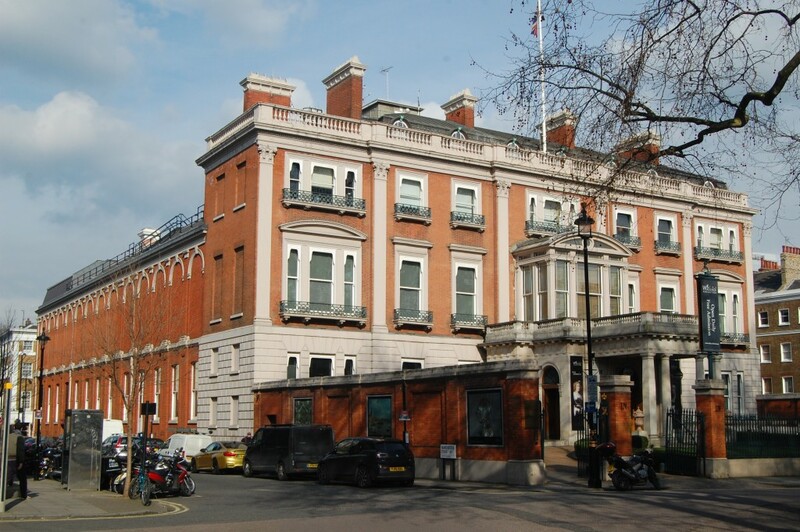 It’s located in Hertford House, Manchester Square, Sir Richard Wallace’s townhouse. In the glazed-in courtyard there is a brasserie restaurant, the Café Bagatelle, named after Sir Richard’s French residence. Like the Lady Lever Art Gallery in Port Sunlight, the Wallace Collection is a static collection reflecting the taste of its period. Nothing may be added or subtracted, and nothing from the Wallace Collection can leave the building, even on loan. You could visit the Wallace Collection every day for a year and still find fresh treasures. I had always regarded Franz Hals’ ‘Laughing Cavalier’ as somewhere between an icon and a cliché until I stood in front of the original and marvelled at the minute detail of the textiles, particularly the lace, and the realistic treatment of his beard and moustache. The breadth of the collection and the sheer volume – twelve Reynolds, nineteen Canalettos, several hundred pieces of Sèvres porcelain, nearly two dozen pieces of Boule furntiure – provides a plethora of enjoyment. The Wallace Collection is open to all, free of charge, 362 days a year: http://www.wallacecollection.org/visiting. This entry was posted in Life-enhancing experiences, Victorian Architecture on June 5, 2016 by Mike Higginbottom.